Oklahoma, United States – Alertra, a leading provider of Internet server monitoring and alerting services, announced that it is offering a 30-day free website monitoring trial. 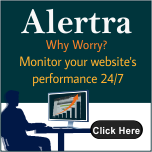 With Alertra’s 30-day free website monitoring trial, get notified when your site goes down. The trial package includes monitoring websites, e-mail servers, routers and any other servers or hardware connected to the Internet. “We want to make it easy for businesses to sample this service. There is no need to install or maintain software to experience the benefits of website monitoring. We’re excited for people to try us and see our service at work” he added. In addition to free 30-day trial, they are offering two other services for free. First is quick and easy Spot Check. Enter a URL you’d like to check and you will get a report back with some basic information on the performance from various places around the world. The other one is a demo account. This provides limited access to Alertra’s control panel interface for remote server monitoring. You can make use of all the features of the service without any obligation. You need not provide any credit card information to sign up for the trial – no need to worry about automatic billing after the trial period! There is no obligation to upgrade to a paid account. You can upgrade only if you are satisfied with the service during the trial period. About Alertra: Established April, 2000, Alertra has become a leading provider of Internet server monitoring and alerting services. Our U.S. headquarters is located in the historic W.E. Going (Town Center) building in downtown Stillwater, Oklahoma. Alertra monitors the availability and performance of Internet-connected devices. We provide timely alert notifications and access to detailed reporting. Since April, 2000, we’ve provided monitoring services to more than 25,000 businesses and other organizations. Although most are based in the United States, a significant number are located in the United Kingdom, and in more than 30 other countries. Our customers range in size from small businesses to Fortune 500 companies.